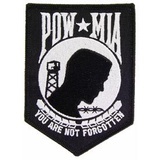 This POW-MIA Patch measures approx. 3 inches. Great for any jacket, bag or a hat!